Yesterday my wife found the ‘commemorative’ map my scoutmaster gave me when I did my first 50-miler as a Boy Scout – the very hike that inspired the trek we will be doing this summer. For each boy that completed that trip, our scoutmaster bought a map, highlighted the route, marked our campsites, and listed the dates and all attendees. These were then given to each of us. That man was Ronald O. Gibson. The lessons I learned from him changed who I was, and he still has a large effect on who I am today. That trip is one of the landmark events in my life. I consider Mr. Gibson to be an example and a personal hero. In my mind, this map is valuable beyond measure and I am overjoyed that it is not lost as I had thought it was for so many years. Thank you, Mr. Gibson. The trip I have planned for this summer is dedicated to you. It turns out I was not correctly remembering the year (no surprise). We did that trip August 26 – September 1, 1979, so I was only 12 years old. It is incredible to think that at that age I hiked 57 miles with a 35 lb pack in 6 days. I was just a skinny little 95 lb kid, but I had my Scoutmaster to encourage me and help me along the way. Finding that map has allowed me to compare the route we took in ’79 to the route we are planning to take this summer. There are some differences, some due to changed goals, and some due to the PCT (Pacific Crest Trail) having been re-routed in places since. 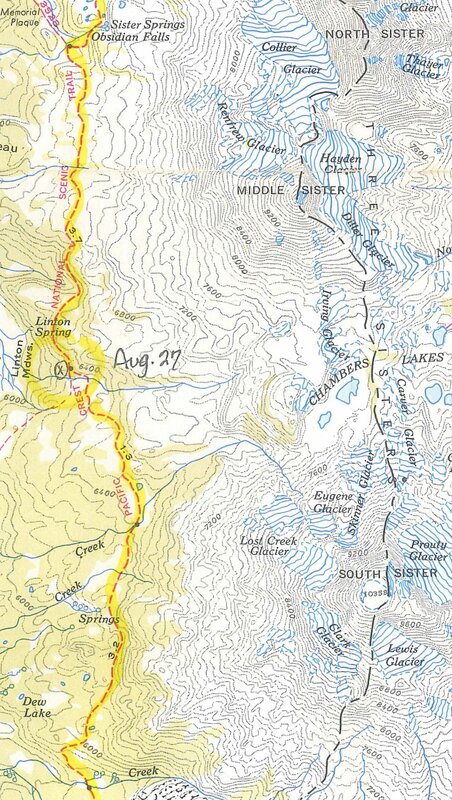 In ’79, we were really hiking the Skyline Trail, which was also the PCT for the most part, but it is not the PCT of today. Although it is largely the same thing, there have been some changes to the route since then. 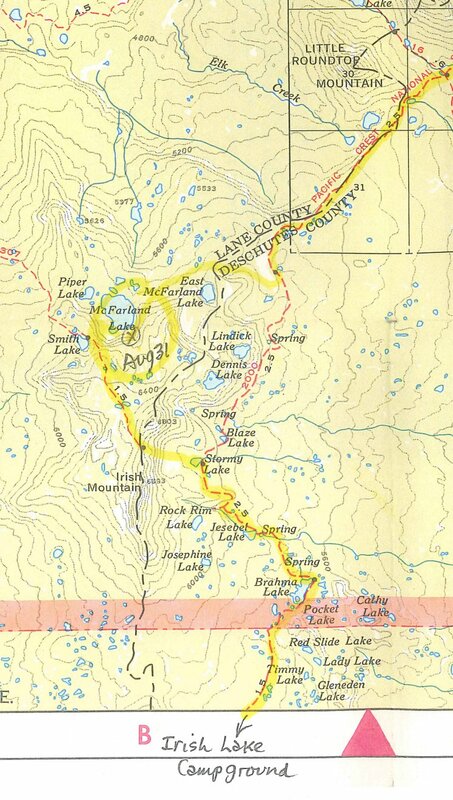 The route we took from N. Matthieu Lake to S. Matthieu Lake is now considered a detour (which we may take this time as well). The official route now passes along the ridge to the east. 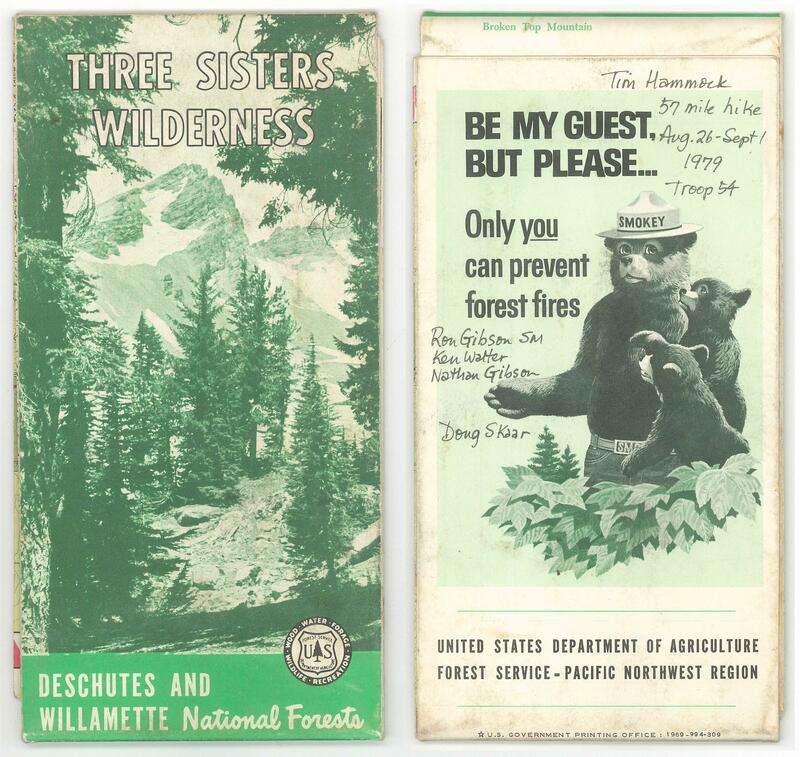 We won’t be climbing the Middle Sister. To do that now requires crampons, an ice axe, and some skills I don’t have yet. Climbing and descending following the route and methods we used in ’79 is now considered very dangerous. At Sisters Mirror Lake, we went west along what was then the Skyline/PCT in ’79. 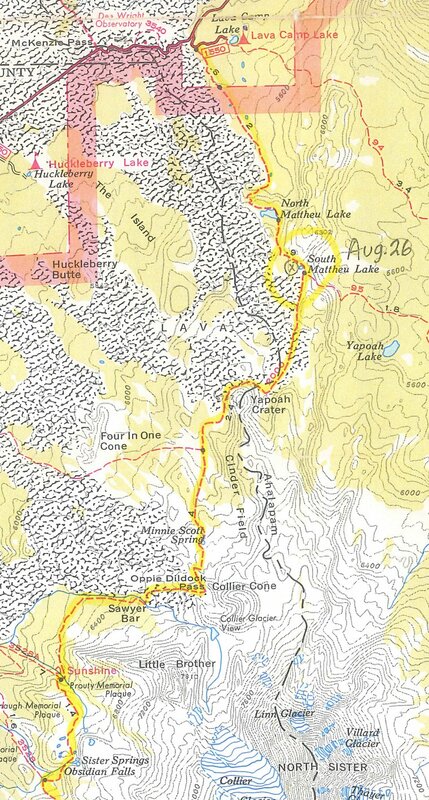 The PCT now goes south toward Elk Lake along what used to be trail 3501, then heads west on what used to be trail 3517 to meet the old Skyline/PCT south of Horse Lake just west of Island Meadow. At Horse Lake, we went to the west a bit to get to Mink lake in 1979. We followed a trail that is now referred to as the Sunset Lake Trail or the Red Hill Trail depending on where you look (the Willamette National Forest site doesn’t even list it any more), until we were almost at Mink, where we followed the Mink Basin Trail to the lake. Right after Mink, we rejoined the Skyline/PCT. We’re not even stopping at Mink this time let alone having a zero-day there, instead opting for a zero-day at E. McFarland. 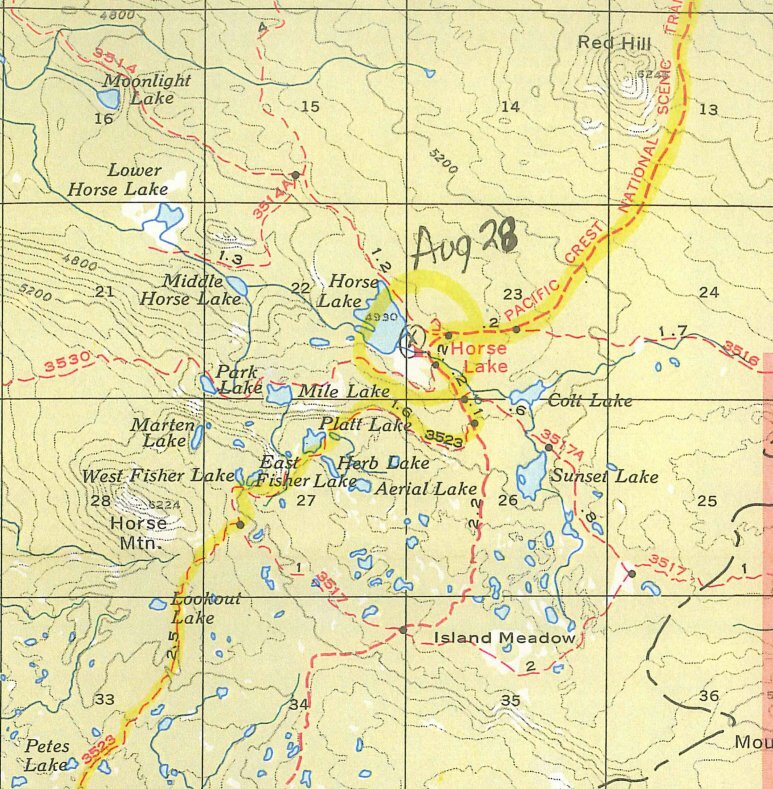 In ’79 we hiked right past E. McFarland Lake to get to McFarland Lake, where we camped. We will stop at E. McFarland instead – it is smaller, but still plenty big and a nicer lake to stay at (my opinion after over a decade of going to both lakes every year). We also will not be taking the hard route out we used in ’79, but instead will simply retrace our steps back to the PCT. 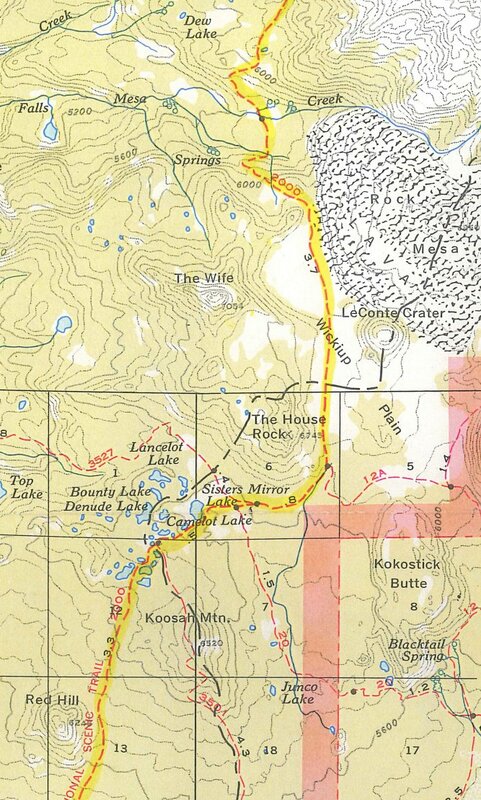 In ’79, we left the Skyline/PCT at Lily Lake to follow the Harralson Trail to Waldo Lake. This year we will continue down the PCT another 20 miles to Hwy 58 instead. Of course one of the biggest changes is the popularity of thru-hiking the PCT. In 1979, it was something for serious backpackers only and there weren’t that many doing it. This year they are predicting over 1,000 people will thru-hike the PCT. Most go northbound, and we will be hiking southbound, so due to the timing of our trip I suspect we will likely plow through a good part of the “main herd” of thru-hikers. So while we saw almost no one all week in ’79, I don’t expect a lot of solitude this time. I have scanned the sections of the map that show our route 35 years ago. I wanted to put them side-by-side with current maps, but as the current best maps are not the same scale as that old map, it got pretty complicated pretty fast. So I’ll just present the scans as they are, albeit cropped to just the area around our route. 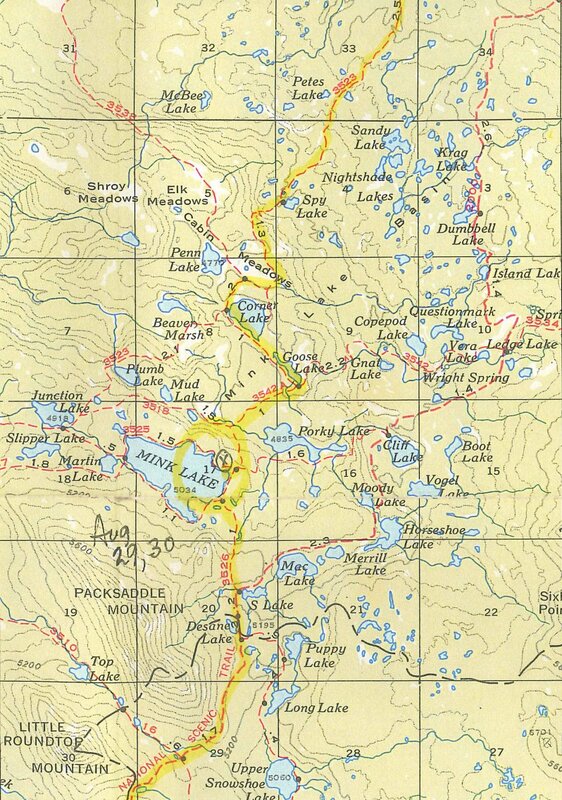 In addition, the old map didn’t actually show our destination (Waldo Lake), however all of the missing trail was hiked on our last day. Boy does that bring back the memories! That was one of the hardest things ever; watching you, with your buckling knees, leaning forward to balance your over-weight pack, disappear into the trees with Ron and the troop. I definitely had my reservations, but Ron assured me you would be fine. I think you were carrying the first meal so your pack would be a little lighter shortly. That was real food, not the freeze-dried stuff of today! Crazy!